USA Hard Charger Cory Eliason has been confirmed as a starter in the KRE SPEEDWEEK component of QSS World Series Sprintcars, the 31st annual tour. The 26 year old from California will join the Adam Currie/Jared Wilson owned Team5nine based out of Adelaide for the high intensity, drama charged mini-series that has become a fan favourite over recent years. 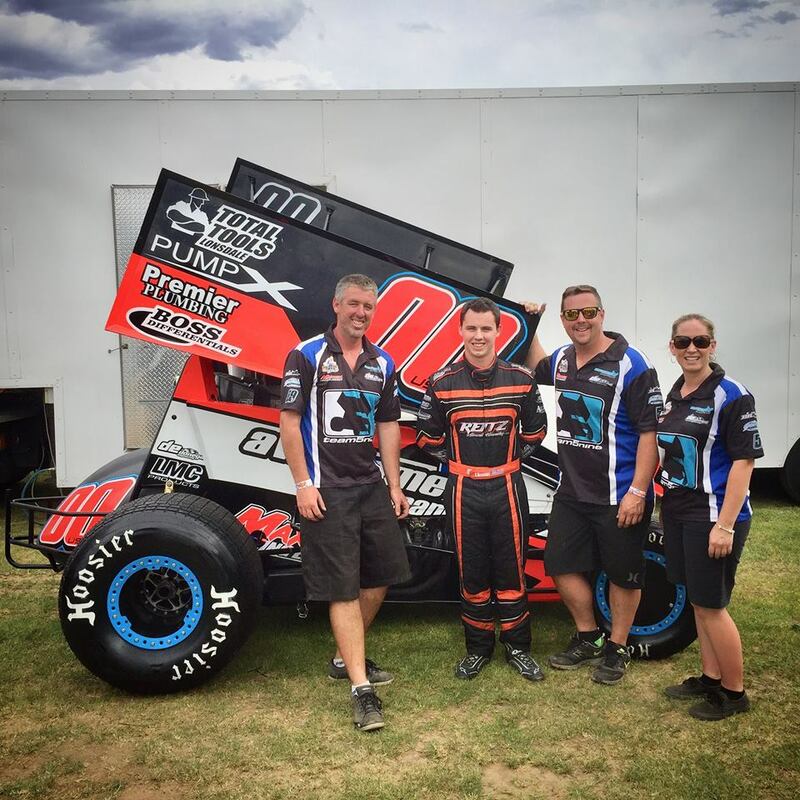 Eliason has enjoyed a successful USA season to date winning 9 feature events including a direct A-Main start at the Knoxville Nationals and is looking forward to his return to Australia, “I’ll be sharing in a much heavier work load than previous commitments in Australia” Eliason said. Eliason put a ‘cat among the pigeons’ when he snatched the $10,000-to-win 360 Allstar Challenge at Simpson Speedway in early 2017 and will return to defend his crown on January 13. “The deal has taken about 6 months to come to fruition“ Currie said. “We are excited to be a part of WSS in season 2017-2018 and for that purpose we have imported a car previously owned by Cory. Manager of Premier Speedway David Mills is pleased by the potential of KRE SPEEDWEEK. “This will be a spectacular week of racing, boasting big names of Sprintcar racing in Australia plus visiting Americans. Photo: Eliason flanked by Team5nine, Jared Wilson (left), Adam Currie and Liz Weaver.